I was at Salem Middle School today with the fabulous librarians Debbie Dupree and Tory Borowsky. I spoke to 6th, 7th, and 8th grade students…all great kids, well prepared with wonderful questions. 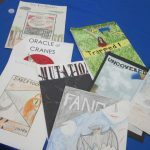 The art class made very cool book covers with titles and summaries of their proposed books. I want to thank Yosef and Chase for the very nice illustration and book title, which I might just steal. It’s hot here in NC upper 80s lower 90s. Thick yellow pollen coats all the cars. People sneezing. Apparently I’m not allergic to whatever it is. Back at the hotel relatively early. Out in the lobby writing as they clean my room. We all really enjoyed your visit to Salem. I’m a sixth grade teacher there, and my son is an eighth grade student. He’s already read Peak, and now he’s planning to read Thunder Cave. My son is from Ethiopia, so a book set in neighboring Kenya is of interest to him. Thank you for an interesting and informative presentation. ← I,Q Two #51 Final. “I,Q Book Two: The White House” is finished!!! !